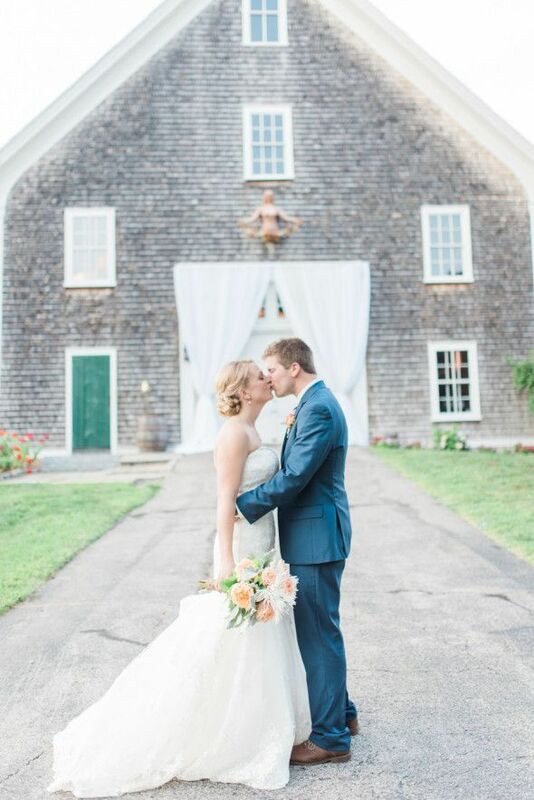 Mount Hope Farm presented by Russell Morin Catering + Events is a historic wedding venue located in Bristol, Rhode Island. With a classic New England landscape and 127 acres of open space, this breathtaking venue is perfect for an elegantly rustic wedding. Our circa 1860 Barn is one of the oldest buildings on our property. Its most recent renovation was done by the Haffenreffer family, the Barn’s last private owners. Our Barn is charming yet polished. Upon stepping in you will see and feel its open airy space with tall ceilings and wooden floors. The Barn is a year-round venue space equip with heat and air conditioning, as well as restrooms located conveniently inside the building. In the winter months, our guests are invited to take advantage of the warmth and ambiance of the Barn’s gas fireplace, adding one more perfect touch to your special event. The Barn is especially charming when the authentic barn door is open, offering a full view of the beautiful gardens and fields of the historic Governor Bradford House. Cove Cabin was built in the early 1900’s by the Haffenreffer family. This Adirondack style cabin is nestled in a grove of red cedars, approximately 1.25 miles from the main entrance of our Farm. The Cabin is perched on a rustic rise overlooking beautiful Mount Hope Bay and offers a breathtaking view of the Mount Hope Bridge and every summer sunset. Adjacent to the Cabin is a large grassy field perfect for your ceremony or a tented affair.